Blog » Welcome Springtime with Crafts to Pair with Our NEW Books! Welcome Springtime with Crafts to Pair with Our NEW Books! These fun and easy pirate hooks make for a great afternoon game of dress up with your little mateys! Cut strips of purple construction paper, fan them out and tape them together at the base. Tape them between the two tips at the end of the tail. 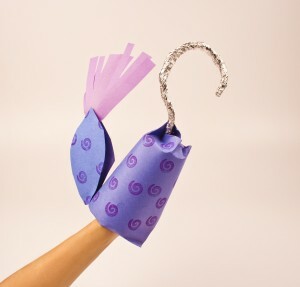 For a more simple party hook, just wrap your cup in wrapping paper and have yourself a swashbuckling time! 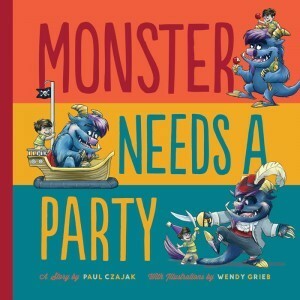 Not only does this activity give you and your Mighty Kid lots of quality bonding and crafting time, but you’re left with a Monster Needs a Party themed fort when the job is done! A few of these steps are for grown up mateys, and some are for little mateys, so be sure to divvy up the tasks. Here’s to many days of pirate ship fun! 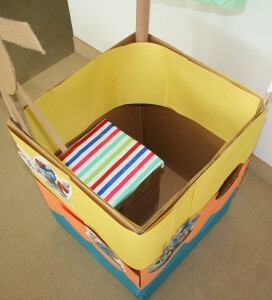 Tape construction paper to the outside/inside of your boat, and paint it as desired -- decorate however you like! We chose to paint on some waves. 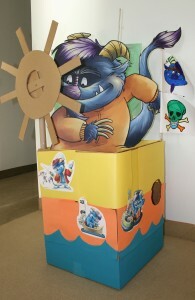 Print/cut out Monster Cutouts and use them to decorate your ship! Tape one of your small boxes shut, and decorate it. (We wrapped ours in wrapping paper.) Then place it inside the boat – this is your steering wheel seat! Affix the steering wheel above the decorated seat – it should spin! Tape the two paper towel rolls to the top of the wrapping paper roll, making a T-shape – now you’ve got a mast and boom for the sail! Affix the flagpole to the side of your boat to prove your boat's allegiance to Monster! 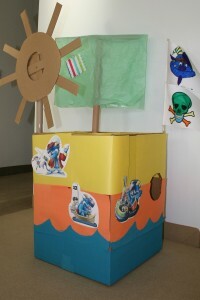 Now you’re ready to set sail on the open sea with Monster and Boy! 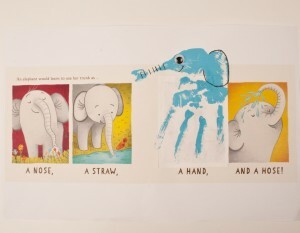 Your mighty kid can now lend a hand to Elephant's story with this project! 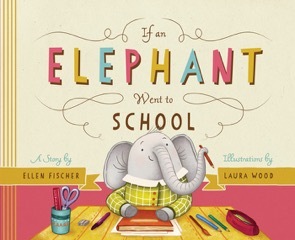 Using this sneak peak into the forthcoming book, your child can use their hand print to create an elephant of their very own. Before you and your little one get started, you will need to print off the Elephant Spread provided (and tape the two pages together). Paint - your choice of color! Hang the artwork up on the refrigerator! Elephant lost her trunk, and she needs YOUR help! 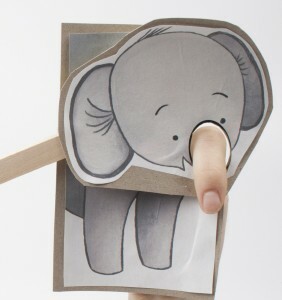 Use your finger to help Elephant feel like herself again. Before you begin, print out the Elephant Body Parts and cut them out! Place your finger through her face and help her smell, slurp, grab, and spray once more!